Winmate just releases new high brightness LED backlight product line, which has the following breakthrough advantages. 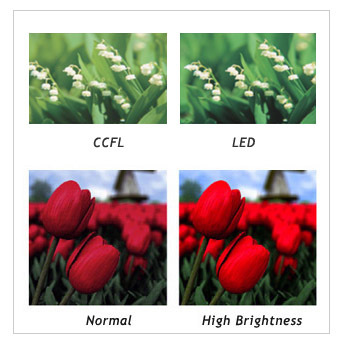 Comparing to the traditional CCFL backlight displays, the LED (Light Emitting Diode) is a energy-conserving, long-live, low-polluting, high-efficient product, and is turning into an answer of the future lighting management. In addition, the series is suitable for special industrial applications. The luminance of them is up to nearly 800-1000nits for superior performance in outdoor and sunlight applications, and users can get clearer and more colorful image.